Worm composting is the breaking down of organic materials through microbial digestion in the worms gut. In other words, worms eat the stuff we place in our compost beds, piles and bins and then poop out nutrient rich compost which come out of the worm ready for your garden. In order to ensure the right environment for worms the needs of the needs of the worms must be met. The worm bedding must have a free flow of air. If there isn’t enough air, and if there is too much water anaerobic conditions will develop which will cause worms to die and bad microbes will flourish. The outcome will be a stinking, slimy mass of mess death. One way to keep your worms healthy is to provide an aerobic environment, which means providing the right amount of moisture and plenty of air flow. The best way to create an aerobic environment is through layering the organic materials that you wish to compost. There are different worms for different types of tasks. We are primarily talking about Red wigglers, red worms, composting worms, Euroworms and African Night Crawlers. They can all be considered composting worms because they eat decaying food scraps and things like newspaper and cardboard if prepared properly for entry into the worm bed. The best method is to provide the right amounts of organic material, or food for your worms is to including layers of organic material. For this you will need brown and green organic material. · Brown material is something like straw, shredded newspaper, shredded cardboard, dried grass clippings, dried horse or cow manure, or dried rabbit droppings. · Green material can be green grass clippings, fresh green vegetable scraps and that sort of thing. You will layer the green and brown organic material by alternating a brown layer with a green layer. Moisten the layers with a spray of water. Use only enough to wet the material but not enough to drench it. 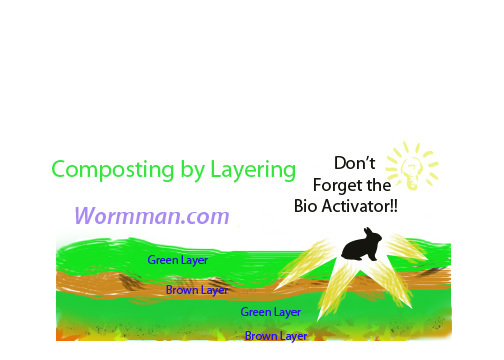 Add your bio activator by inserting it so that some of the compost activator touched every level by digging into the pile and inserting it there. Water again and wait. Water daily if you are not getting rain but do not drench. Use just enough water to ensure the pile stays damp. After three or four days feel the top of the heap with your hand. It should be warm. The heat is caused by the decomposition of the decaying organic matter. As soon as the pile begins to heat and break down then you have to use a spade or a hay fork and turn the pile. Have a hose nearby and lightly spray the pile with each turn. Just mist the pile. Do not soak or this can disrupt the process. Turn and water your compost every other day until the heating stops. You want to ensure that every organic element is brought into the pile in order to come into contact with the microbes that are making your compost. When the heating stops you can add your worms. Waiting for the heating process to end is very important because the composting organic material can get very hot and the worms will try to escape the heat. They will crawl off or they will die in the bed. Once the heating stops, which should not be more than a week, then you can add the worms. Place them in the bed and give them a little water. They will immediately escape the light and head into their new home. Water the worm beds when needed. You should not be able to squeeze more than a couple of drops from the bedding. Any more than that and it is too wet. Turn your bedding daily in order to keep it fluffy and aerated. When the bedding is filled with castings it is time to remove the worms to a new home and then use the castings for what you want. If you want to harvest babies then remove the adults to a new bed after they have finished eating in their old home and let the capsules hatch out baby worms. Feed the babies in the old bin with aged manure or small amounts of fresh rabbit manure. Place the food on the top of the bin and cover it with a sheet cut from black garbage bag. Use just enough plastic to only cover half of the bin. The babies will mass under the black plastic as they eat the food. You can easily remove the babies and place them in their own bin to grow out into breeders. Use the worm castings in your garden and house plants in place of chemical fertilizer. · If the worm bedding smells then reduce the amount of water and add more brown material. Turn daily to help aerate. · If it the compost does not heat then add more activator and a little more water. Add more green organic material like food scraps. · If you notice bugs, besides your composting worms, just leave them be. They are compost worm helpers and you need them in your compost heap. If you have too many flies then make sure that you bury your food scraps in the bedding. Flies should not be a problem in a worm bed if the food scraps are properly buried. · Remember to start your worm bedding prior to receiving your worms so that you can get the worm bed composting and past the heating stage so that they worms will have a nice home when they arrive.